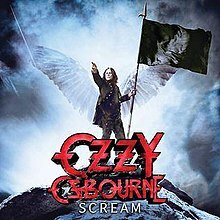 Scream is the eleventh studio album by English heavy metal singer Ozzy Osbourne, released in the United Kingdom on 14 June 2010 and his most recent solo album as of 2019. The album was recorded at Osbourne's home studio "The Bunker" in Los Angeles, California and produced by himself and Kevin Churko, who had previously worked on Black Rain in 2007. The album was considered a commercial failure though it sold to moderate success in the digital age of musical downloads reaching number 4 on the U.S. Billboard 200 chart and number 12 on the UK Albums Chart. "Let Me Hear You Scream"
Originally titled Soul Sucka, the album was later changed to Scream after fans voiced their objections to what they deemed a cheesy and Sharon Osborne influenced album title. The album is the only one to feature guitarist Gus G, who replaced long-term guitarist Zakk Wylde. The drums on the album were recorded by Kevin Churko, though Tommy Clufetos was credited, as he was touring with the band at the time. Scream is also the first release to feature keyboardist Adam Wakeman, who has worked with Osbourne as a touring musician since 2004. The lead single released from the album was "Let Me Hear You Scream", which peaked at number 6 on the American Rock Songs chart. It is also his first since 1986's The Ultimate Sin to use his classic logo. A 2-CD, "Tour Edition" version of the album was released in the U.S. on 5 October 2010. This package contains the original album on disc 1 and a second CD with seven bonus songs: "One More Time" (originally an iTunes pre-order exclusive), "Jump the Moon" (originally a bonus track on the Japanese release), and "Hand of the Enemy" (previously unreleased) from the Scream sessions, and four additional live tracks recorded during the UK leg of the Scream tour: "Bark at the Moon", "Let Me Hear You Scream", "No More Tears" and a live recording of Black Sabbath's "Fairies Wear Boots". A four-sided vinyl edition, containing the aforementioned studio tracks along with the live version of "Let Me Hear You Scream" and the single version of "Life Won't Wait", is also available. To promote the album, an Ozzy Osbourne track pack had been released as downloadable content for the Rock Band video game series, containing three Scream songs and three of Ozzy's greatest hits. "Let Me Hear You Scream", "Soul Sucker" and "Diggin' Me Down" were released alongside "I Don't Wanna Stop" (from the previous album, Black Rain), "Crazy Babies" (from No Rest for the Wicked) and "No More Tears" on 15 June 2010. Other promotions used to advertise the album include the stunt at the Los Angeles Dodgers vs. Los Angeles Angels of Anaheim MLB game on 12 June 2010, in which Osbourne encouraged the crowd to scream the title of the album as loud and as long as possible. The goal was to earn the Guinness World Record for loudest and longest scream from a crowd, and it was met successfully. Although the official decibel level has not been announced, the stadium beat the previous record set by a group of Finnish Boy Scouts, which was 127.2 dBA. The money earned was donated to ThinkCure! to aid cancer research. Osbourne has also appeared on many new commercials, video games, albums, etc. to promote the album. "Let Me Hear You Scream" hit number 1 on the US Mainstream Rock Tracks chart, which is Osbourne's second single to achieve such a feat. The song was featured along with "Crazy Train" in the video game Madden NFL 11. "Life Won't Wait" reached No. 1 on the Mediabase rock chart in Canada, making it his third single to achieve such a feat. "Life Won't Wait" was announced in the Production Notes, but was not actually played during the end credits for the horror film Saw 3D. CBS had also promoted the song "Let Me Hear You Scream" in their television show CSI: NY and it was also featured in the 6th-season episode "Redemption". The making of the album "Scream"
^ "Scream Reviews, Ratings, Credits, and More at Metacritic". Metacritic. Retrieved 5 June 2012. ^ Monger, James Christopher. "Ozzy Osbourne - Scream review". AllMusic. All Media Network. Retrieved 20 December 2015. ^ Moffitt, Greg (2010). "Ozzy Osbourne - Scream review". BBC Music. BBC. Retrieved 20 December 2015. ^ Perry, Andrew (18 June 2010). "Scream: Ozzy Osbourne, CD review". The Telegraph. The Daily Telegraph. Retrieved 20 December 2015. ^ Collis, Clark (25 June 2010). "Scream Review". Entertainment Weekly. Retrieved 5 June 2012. ^ Kaz, Jim (21 July 2010). "Ozzy Osbourne: Scream Review". IGN. Retrieved 20 December 2015. ^ Begrand, Adrien (25 June 2010). "Ozzy Osbourne: Scream". PopMatters. Retrieved 5 June 2012. ^ Greene, Andy (15 June 2010). "Scream - Ozzy Osbourne". Rolling Stone. Retrieved 20 December 2015. ^ "Scream Staff Review". Ultimate Guitar Archive. 22 June 2010. Retrieved 20 December 2015. ^ Katapidis, Nick (3 May 2014). "Interviews: Gus G." Noisefull.com. Retrieved 22 December 2015. ^ a b c d e "Scream Billboard Albums". AllMusic. All Media Network. Retrieved 22 December 2015. ^ a b "Ozzy Osbourne Official Charts". Official Charts Company. Retrieved 25 October 2015. ^ "Ozzy Osbourne:New Album Title Announced". Blabbermouth.net. 29 March 2010. Retrieved 22 December 2015. ^ "Billboard CD reviews: Eminem, Cyndi Lauper, Macy Gray". Reuters. 23 July 2010. Retrieved 19 August 2010. ^ Lafon, Mitch (14 February 2011). "Drummer Tommy Clufetos - "I'm A Straight Ahead Rock 'N' Roller And So Is Ozzy; It Totally Works Perfect"". Bravewords.com. Brave Words & Bloody Knuckles. Retrieved 22 December 2015. ^ "Scream Billboard Singles". AllMusic. All Media Network. Retrieved 22 December 2015. ^ a b "Ozzy Osbourne:'Scream' Tour Edition To Receive U.S. Release In October". Blabbermouth.net. 26 August 2010. Retrieved 22 December 2015. ^ Kreps, Daniel (7 June 2010). "New Ozzy Tracks Premiere In 'Rock Band'". Rolling Stone. Retrieved 22 December 2015. ^ Wiederhorn, Jon (17 June 2010). "Ozzy Osbourne Fans Scream Into the Guinness Book of World Records". Noisecreep. AOL Music. Retrieved 17 June 2010. ^ "Saw 3D Production Notes". Lionsgate. Archived from the original (.DOC file 4.21MB download) on 30 September 2011. Retrieved 18 September 2011. ^ "Ozzy Osbourne - Scream (Album)". Australian-charts.com. Media Control Charts. Retrieved 24 December 2015. ^ "Ozzy Osbourne - Scream". Austriancharts.at (in German). Media Control Charts. Retrieved 15 August 2011. ^ "Ozzy Osbourne - Scream". Ultratop.be (in French). Media Control Charts. Retrieved 15 August 2011. ^ "Ozzy Osbourne - Scream". Ultratop.be (in Dutch). Media Control Charts. Retrieved 15 August 2011. ^ "Albums Top 100: Ozzy Osbourne - Scream" (in Czech). Ifpicr.cz. Retrieved 15 August 2011. ^ "Ozzy Osbourne - Scream (album)". Danishcharts.com. Media Control Charts. 21 June 2010. Retrieved 15 August 2011. ^ "Ozzy Osbourne - Scream". Dutchcharts.nl (in Dutch). Media Control Charts. Retrieved 15 August 2011. ^ "Ozzy Osbourne - Scream (Album)". Finnishcharts.com. Media Control Charts. Retrieved 15 August 2011. ^ "Ozzy Osbourne - Scream (Album)". Lescharts.com (in French). Media Control Charts. Retrieved 15 August 2011. ^ "Album – Ozzy Osbourne, Scream". Charts.de (in German). Media Control Charts. Retrieved 24 December 2015. ^ "Ozzy Osbourne - Scream (Album)". Greekcharts.com. Media Control Charts. Archived from the original on 17 March 2012. Retrieved 24 December 2015. ^ "Top 40 Album" (in Hungarian). Magyar Hanglemezkiadók Szövetsége. 5 July 2010. Retrieved 15 July 2010. ^ "Ozzy Osbourne – Scream (Album)". Italiancharts.com. Media Control Charts. Retrieved 24 December 2015. ^ "スクリーム・ジャパン・エディション オジー・オズボーン". Oricon. Retrieved 15 August 2011. ^ "Ozzy Osbourne - Scream (Album)". Media Control Charts. Archived from the original on 21 October 2012. Retrieved 22 December 2015. ^ "Ozzy Osbourne - Scream (Album)". Charts.org.nz. Media Control Charts. Retrieved 15 August 2011. ^ "Ozzy Osbourne - Scream (Album)". Norwegiancharts.com. Media Control Charts. Retrieved 15 August 2011. ^ "Oficjalna lista sprzedaży :: OLiS - Official Retail Sales Chart". OLiS. 27 June 2010. Retrieved 15 August 2011. ^ "Ozzy Osbourne - Scream (Album)". Spanishcharts.com. Media Control Charts. Retrieved 15 August 2011. ^ "Ozzy Osbourne - Scream (Album)". Swedishcharts.com. Media Control Charts. Retrieved 15 August 2011. ^ "Ozzy Osbourne - Scream". Hitparade.ch. Media Control Charts. Retrieved 15 August 2011. ^ "Ozzy Osbourne Chart History: Digital Albums". Billboard.com. Billboard. Retrieved 22 December 2015. ^ "Best of 2010 - Billboard Top 200". Billboard. Nielsen Business Media, Inc. Retrieved 31 December 2010. ^ "Gold Platinum Search for Ozzy Osbourne". Music Canada. Retrieved 25 October 2015. ^ a b "Ozzy Osbourne Reveals New Album Release Dates - in Metal News". Metal Underground.com. 20 April 2011. Retrieved 15 August 2011. ^ a b "Ozzy Osbourne: Entire 'Scream' Album Available For Streaming". Blabbermouth.net. 15 June 2010. Retrieved 24 December 2015.